A few of my colleagues came over to make moonies at my place today. Just sharing with you some of the moonies that we have made. We did the snowskin mooncakes, walnut mooncakes and baked traditional mooncakes. However, the baked traditional mooncake will not be ready to be eaten until at least Wednesday, so no picture to show yet. 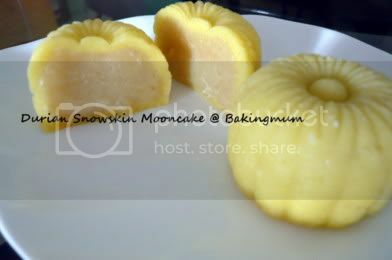 This durian snowskin mooncake was done yesterday. I added fresh durian flesh into the lotus paste. Ur mooncakes look so nice. Could u share the recipe for the walnut moontart? They look so beautiful. You are indeed very talented. Hope to learn from you every day through your blog. 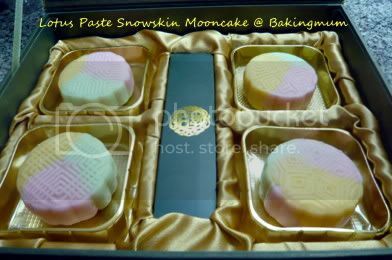 Awesome mooncakes....I hope I can achieve this kinda of standard. Hope u can post the snowskin recipes on the web so I can learn to make. Thanks alots. Clap, clap, clap! Beautiful & yummy handiwork. 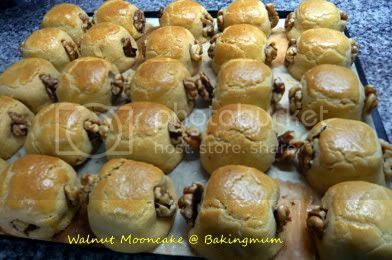 I did 2 batches of your walnut moonies, everyone gave me a thumbs up! Thank you Lee, for sharing the recipe. Lee Lee, All your mooncakes look so beautiful and yummy! !